Walkerville Times - 1136 Devonshire Rd. 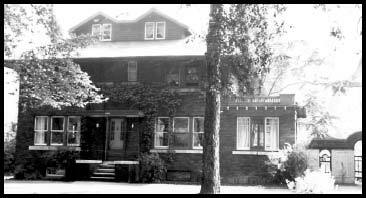 In the last issue of The Walkerville Times, a reader wrote that Harry Lowe, the famous local rumrunner, lived in her house at 1144 Devonshire, which is next door to 1136. According to Mrs. Ramin, Harry Lowe lived at her house not at 1144. (Lowe later built one of Walkervilles most elegant mansions at the corner of Ontario and Devonshire, subsequently owned by Senator Paul Martin). Another former occupant of 1136 Devonshire was Judge John Ayldsworth. "I was surprised to get a call from the people who had purchased our house to tell me that they had found about $90 in the staircase. I had forgotten all about it! I used to keep mad money in the secret hideaway in the third step of the inside staircase. When I came by to claim it, the owners gave me a tour. I was happy to see that they had restored the stove in the kitchen with its big warming oven. They had also painted and redecorated so that I hardly recognized my house.